Dan Potthast is no stranger to touring. The St. Louis native/Santa Cruz transplant has been on the road performing for over 20 years in MU330, The Stitch Up and as a solo artist. You may have seen him over the past few years as opening for the likes of Reel Big Fish and Streetlight Manifesto, but this summer Dan opted to take his guitar and booming voice into living rooms across the continent. 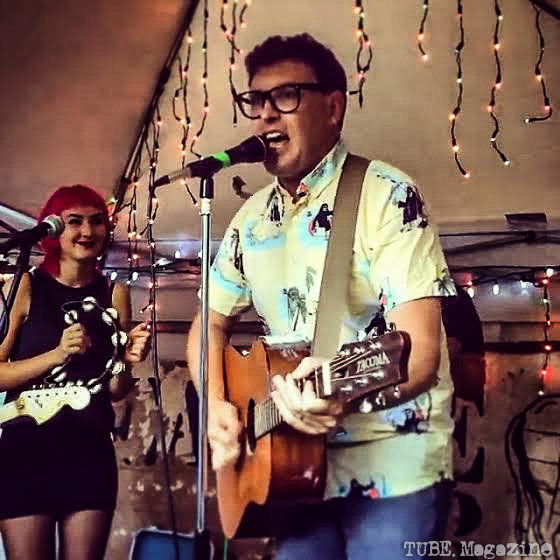 On day 50 of his 66 date Living Room Tour, Dan drove into Sacramento to perform in Jerry Perry’s backyard with Kepi Ghoulie, Dog Party and David Houston. Once their fun round-robin set was over, TUBE. was able to get a few words in with Dan about his time on the road, progress on his side projects, and where he’ll be heading once this tour is complete. TUBE: Welcome Dan! You drove in from Portland today? How was the drive? Dan: Thanks for having me! It was long, yeah it’s like 600 miles. TUBE: Besides drumming on the steering wheel, how are you passing that time on these tours? Dan: On this tour, a lot of flipping stations, listening to a lot of new country haha, but music tends to put me to sleep I’m finding out. The one thing that kind of keeps me awake is listening to podcasts, that helps keep me awake if there’s a conversation going. But like a book on tape: not a good idea. Just one voice lulling you to sleep, but Podcasts keep me going. Dan: Started in NY, drove up and down the east coast. I went to Canada for a week, down into the Midwest. Then down to Arkansas, Texas and New Orleans. Been all over, but still got way to go. TUBE: Still a way to go, and then you’ll play shows with the Bruce Lee Band in September? Dan: Yeah, so stoked. I have to learn the songs still, that’s another way I’m passing the time is listening to those songs, trying to drill them into my head. Oh, and I’ve also been pulling over and skipping rope trying to get in shape for the Bruce Lee Band tour, because I know I’m just going to be playing guitar, and I have to be able to skank the entire time haha! TUBE: What can you tell us about Sharkanoid? Dan: Sharkanoid is a new band I’m in with Rick Johnson, bass player of Mustard Plug, and we co-wrote an album together, and it is ROCK AND ROLL. I’m really excited about the album, it sounds awesome I think. Rick recorded it and he did a really good job. Yeah, basically we had this project where he had the idea that let’s each write half the album, we’ll get inspiration by looking at yearbook photos, so we opened random yearbooks, looked at the photos, and tried to write songs based on the people in the yearbooks. Then we sent them back and forth, re-wrote, helped each other out, and got 12 songs recorded that I’m psyched on. I’m not sure if the band’s going to be a touring band or not, but Community Records is putting the album out, and any day I should have the CDs in my hand. I haven’t announced it or anything, you’re the first, you’ve got the scoop! TUBE: Awesome! You’ll also be touring with Voodoo Glow Skulls and Mustard Plug, are you guys going to hit the west coast? Dan: No, that’s going to be Midwest and a little Colorado, and the South. It’s short, maybe two weeks. I think it starts in St Louis and ends in New Orleans, it’s really brief. I’ll be playing solo on that, but I was thinking maybe Sharkanoid… I don’t know, maybe. TUBE: When can we expect to get our hands on the new Bricks album? Dan: Not for a long time, that’s the most honest answer. All the songs are written actually, we’ve demoed most of them and worked stuff out, but we still need to get a little tighter on them, and go in and record them, and that process takes awhile. I’m psyched on the new album, I think it’s going to be really good. The Bricks record was one that right out of the gate I felt good about, I feel like man we went in and we nailed it. I don’t always feel like that when I record a record, but I am proud of that Bricks record, so I felt like that’s a good size mountain to climb to do our second album, it’s got to be good again. We’re taking our time, putting a lot of work into it, and hopefully it stands up. TUBE: We’re so excited about it, and everything else, we can’t wait. Thanks for taking the time to talk with us! TUBE: We’d like to come over here (to the merch table) and spend our money on you now though, too..
Dan: Haha ok, I won’t turn you down! Tags: Asian Man Records, Bruce Lee Band, Cattle Club, Dan P, Dan P and the Bricks, Dan Potthast, david houston, Dog Party, Jeff Rosenstock, Jerry Perry, Jerry Perry Presents, Jerry Perry's Backyard, Kepi, Kepi Ghoulie, Living Room Tour, Mike Park, MU330, Mustard Plug, Reel Big Fish, Sharkanoid, Skankin' Pickle, Streetlight Manifesto, Sven Olai, svenolai, The Bricks, The Chinkees, The Stitch Up, TUBE, tubemag, Voodoo Glow Skulls. Bookmark the permalink.